Today starts the ten-day period of voting for the Doodle4Google contest where my daughter is one of the finalist. 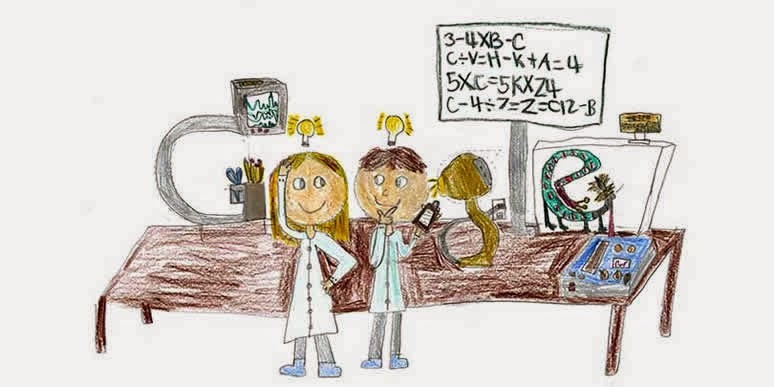 She is the State of West Virginia's Winner for this year's 6th Annual Doodle4Google. Below is her official entry. Thank you all for casting your votes! Result will be next week. We are keeping our fingers crossed! I received my Serafino Double Wall Insulated Beverage and Coffee glasses from Ozeri to review. This set is perfect for us to use since there are four of us in the family. I already packed away the Moderna Artisan that I got from them last time. This is the full description of this insulated glasses. I like these kind of glasses because you can use it both for hot and cold beverages. The packaging is really good, they make sure that it won't get damaged when in-transit. The only thing that I am not impressed with is the quality of how it's made. As you can see in the above-photo, the finish of the glasses is not really polished. I found one glass with a damage too when I had the Moderna Artisan that I previously reviewed. These glasses are made in China so that's probably why the quality isn't to a high standard. I like the Serafino more than the Moderna because of it's height. My kids can use their glass straws perfectly with the former glasses. This is on sale now for $28.95, you can check it out by visiting this link. Thanks again Ozeri for this opportunity. Mother's day is just around the corner and I am sure you are already planning what to get for your dear Mom, well, this might just give you an idea. I love how they individually packaged their products. There's also little tags attached to it that say "From Estonia with Love" and the packaging are made from our mother nature. I use non-stick pans so I prefer using these kind of utensils because they are not only good for yiour health but also good for the environment. Are you tired of getting your Mom the same items every year for Mother's day? Why not try to get her a set of eco-friendly wooden utensils from Ecommflash? Ecommflash has over 30 wooden items on sale at Amazon, you can check them out by visiting this link. Thank you Ecommflash for giving me an opportunity to try your eco-friendly products. I am loving them in my kitchen. The weather is becoming warmer as day passes by. Although we have been getting a surprise cold weather once in a while, Spring is here eventually. My kids were delighted when I showed them the big package that we received from Pierre's Ultimate Ice Cream. They packaged the goodies really well using a styrofoam ice box and dry ice. The dry ice provide additional entertainment to my kids as well, will make a separate post for it. The package contained 6 pints with different flavors. I was hoping they would send me the mango flavors but unfortunately, they didn't but now that I know how good their ice cream is, I will definitely check their ice cream from the store to get the mango flavor. My son does not like pecan but I encouraged him to try this butter pecan flavored Ice cream. He was hesitant at first but as soon as he tasted how good it was, he was hooked. We haven't tried the iHola Fruta Black Cherry Lemon one but I am sure that it would be as good as the butter pecan one. The chocolate lava cake is one of Pierre's signature Ultimate ice cream flavor. It has chocolate and vanilla ice creams with chocolate cake and fudge swirls. The banana fudge chunks has walnuts and fudge chunks. This would be great to make a banana split treat fir the kids. My husband's pick is this Chocolate Frozen yogurt. He is on a diet now but it doesn't mean he couldn't have some. He tried this one and love it! I love this pomegranate and blueberry combination since I love pomegranate and blueberry fruits. Hola Fruta is available in 7 pint flavors which includes black cherry lemon, mango (the one I want), Margarita, Peach, Piña Colada, strawberry, and the one I showed above. Their signature includes banana fudge chunk, cherries and chocolate chunks, , chocolate lava cake, coconut fudge almond, exquisite vanilla, mocha mud pie, and nun butter snickerdoodle. Look at this little man, he thought he doesn't like pecan but that notion changed with the Pierre's Ice cream lol. My daughter who isn't into sweets really enjoyed her ice cream, in fact she asked for another serving that day. Pierre's.... It's our favorite Ice Cream NOW! Thank you Pierre's for letting us try your delicious ice cream! You can check them out and like their Facebook and follow them on Twitter. We visited my FIL yesterday after we attended church. My kids got their Easter treats from their Aunt Crystal, thanks Chris! My FIL was taking a little snooze when we arrived, he said it's the reason why he burned the green beans he was cooking earlier. We were not able to attend the Easter gathering at my FIL's home. This is something that I can whip up pretty easy and the kids love it. Macaroni with beef and broccoli. My daughter usually digs for the broccoli, she loves it. How about you, do you add anything when you make macaroni and cheese? A friend of mine asked me how to make this so here it goes. Boil the macaroni until its al dente, drain and set aside. Brown the ground beef. Add the broccoli, milk, and let it cook for ten minutes in a medium heat. Add the macaroni and the cheese. This was our breakfast on April 4. Fried rice with peas, carrots, and spam, sliced cucumber, bacon, and scrambled egg with tomatoes and I made some strawberry milk shake. Our daughter love cucumber with balsamic vinegar with a little sugar and pepper in it. The little mister likes it with ranch while hubby and I just like it plain. During school days, breakfast are the easy to prepare ones not like this one but during the weekends, we make sure to make a hearty one. Usually, our 9 year old chef wannabe cooks for us. My kids are enjoying their Easter break. They won't come back to school until Thursday. It gives us ample time to do things together. Being off from school does not mean that they are also off from doing things like reading. My son has test on religion when he goes back so we reviewed for that. Aside from that, we spend 45 to an hour reading every day. We had plenty of books to read here at home. Entertaining them at home is a bit challenging if you have no activities line up for them. I am also glad that we have variety of snacks to munch while doing things. I received a big box full of goodies from Pretzel Crisps to review. I also love the bag and coupon that came with it. At first, my children are skeptical about trying them because they are not very fond of pretzels but once I opened the original deli style one, they were hooked. This is really a way to rethink pretzel. They are thin and very crispy which is why my children loves them. We haven't tried the other flavors yet but I am planning to open the jalapeño next time as I love spicy snacks. I like how they package them as you can zip them open and close which preserves the freshness and crispiness of the crackers. My kids found their new favorite snack on our reading time. You can get creative in serving Pretzel Crisp. Pretzel Crisp is the modern twist of your old time favorite pretzels. You can crunch'em, crack'em, dip'em, or stock'em up. All flavors has the crunch that you will love in a lighter and crisper way. This would be great to make as an appetizer. You can top it with cheese and pepperoni or even a slice of cucumber. Thanks Pretzel Crisp! Preparing food is something that I was not very fond of when I was still single but when I got married, I had to really dig down deep within me to find that passion in cooking. Luckily, Internet is there for easy recipe search and there are so many seasonings available in the market. I've found out that cooking is not as hard as I perceived it to be. I received the gift basket that Kernel Seasoning has sent me for review. I have never tried their seasoning before so I am excited to received different kinds that I can use to add some flavor to our snacks and food. This basket full of goodies made my Easter, yay! The package includes 8 different kinds of seasoning and two packages of pop corn. Up top is the White Cheddar seasoning o perfect to jazz up your popcorn, potatoes, pasta, eggs, vegetables, salad and more. It is made with real cheese which is a plus for those who love cheese with their food or snacks. The butter seasoning is also good with popcorn, pasta, eggs, eggs, vegetables, and rice. I love rice so this one is for me. We love baked potatoes around here so the bacon cheddar would be great to kick up the flavor of the potatoes. This would also be good to add flavor to your pizza, veggies, salad, and chicken or whatever you want with a bit of bacon and cheddar taste. Now, the Ranch seasoning, would definitely jazz up your salad. It's also good with potatoes, pasta, and pizza. We have the boiled eggs left over from the Easter and I am thinking of making some deviled eggs in a bit and the Nacho Cheddar seems to be a good seasoning to add to it. I don't like garlic but I don't mind putting it in my cooking because my husband likes it. The garlic parmesan seasoning would be great for pasta. The caramel seasoning would be great for oatmeal, oat, ice cream, coffee, and for my kids fruits especially apples. To match up the the last two, I used the kettle corn seasoning to a freshly popped Kernel Seasoning Popcorn for our movie time here at home. Although we like popcorn, we don't eat it often at home. We only get popcorn once in a while especially when we go to the movie house. What I don't like about popcorn at movie theaters is the grease. Popping corn at home is fun plus you can avoid the extra grease that you get when you buy them at the movie house. Today is a cheat day for me and my kids. Instead of slicing up some fresh veggies and fruits, I pooped one pack of the popcorn and jazzed it up with the Kettle Corn seasoning. I love the sweetness to it.